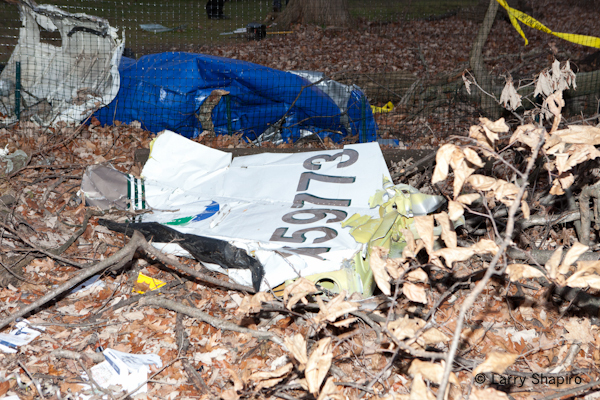 The FAA and NTSB personnel spent much of the day on Tuesday examining the wreckage and scene of Monday night’s plane crash in Riverwoods. 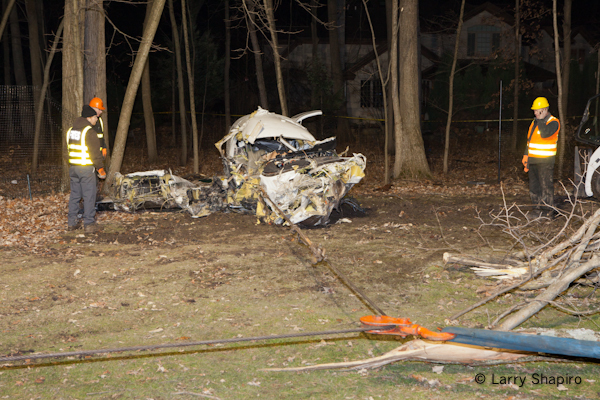 After they were finished, they released the wreckage to Fries Automotive to remove the plane and debris from the scene and transport everything to Campbell Airport in Grayslake. 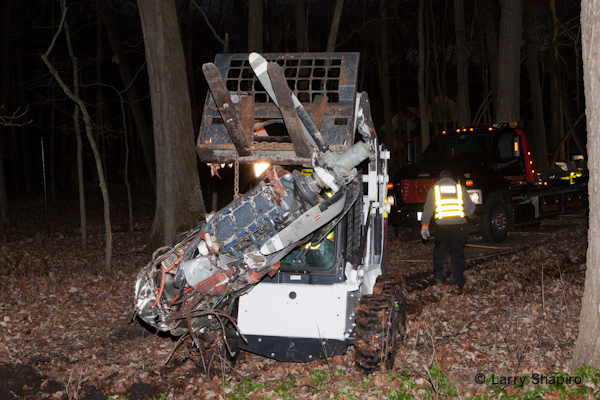 Fries was assisted by Rogner’s Towing out of Palatine. 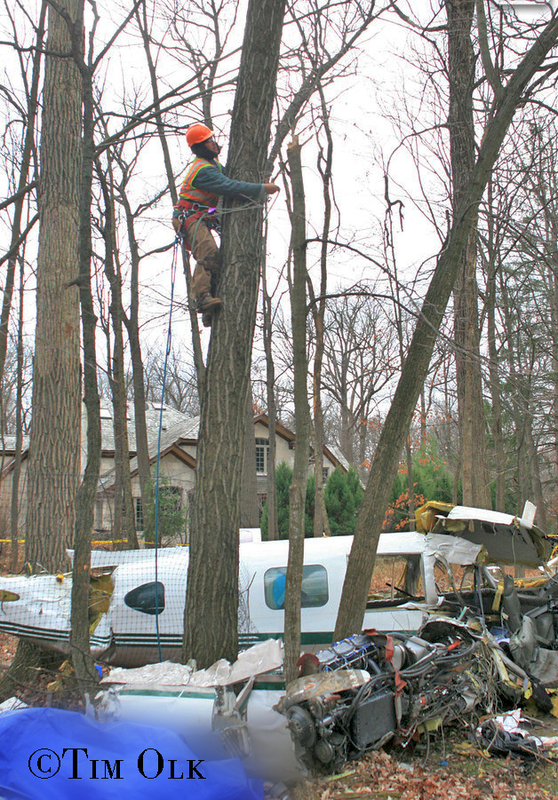 Earlier in the day, a tree removal contractor cut trees that had been damaged by the plane plus those additional trees necessary to clear a path for a truck to access the scene. 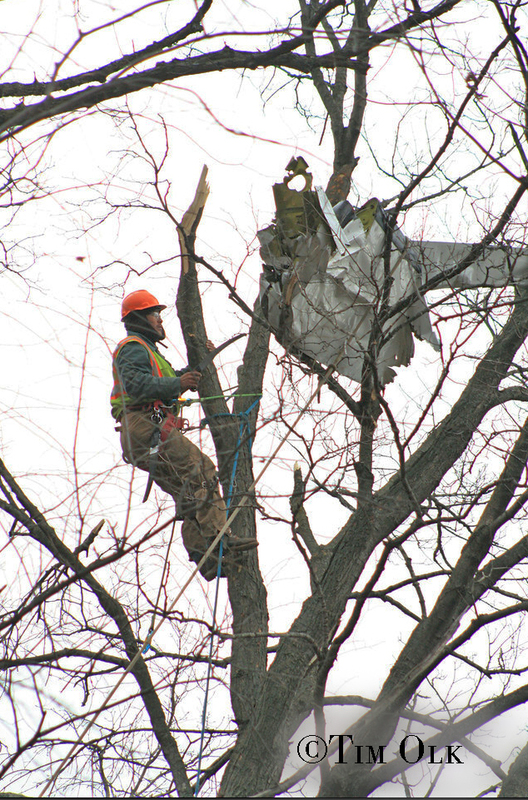 Also, an employee of the tree contractor climbed one of the tall trees to remove a piece of debris that was lodged there. Tim has more photos HERE and Larry has a gallery HERE. 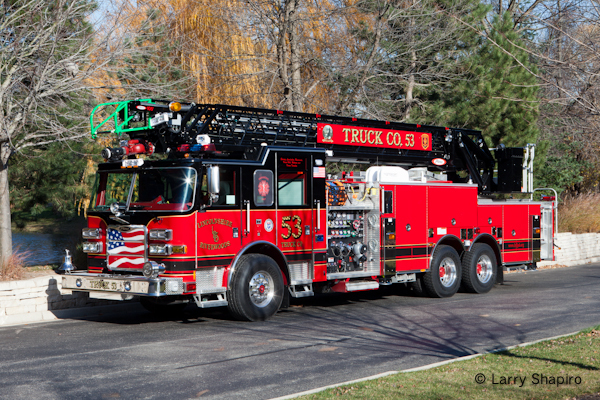 Though Barrington village officials have been discussing ways to save money on fire services, a recent proposal to flip-flop their contractual relationship with the Barrington Countryside Fire Protection District apparently is no longer on the table. 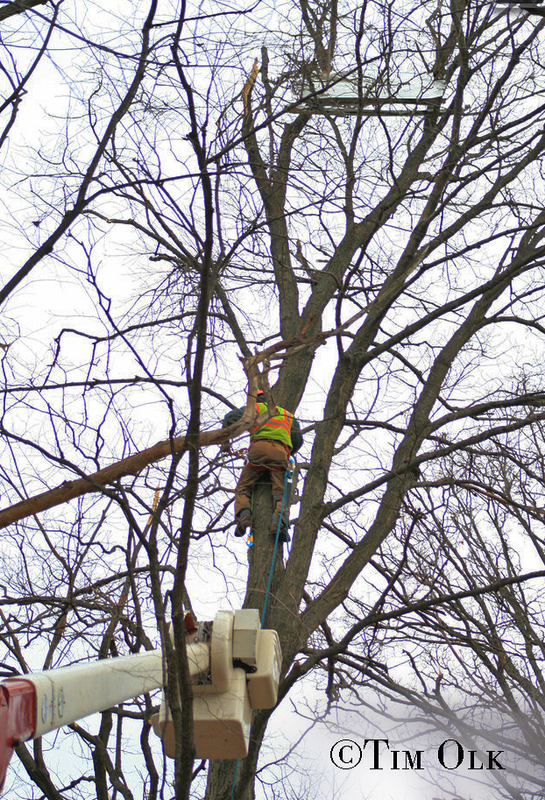 Under the proposed change, the fire district — which serves a 40+-square-mile area around the village of Barrington — would become the contractor and the village its customer. 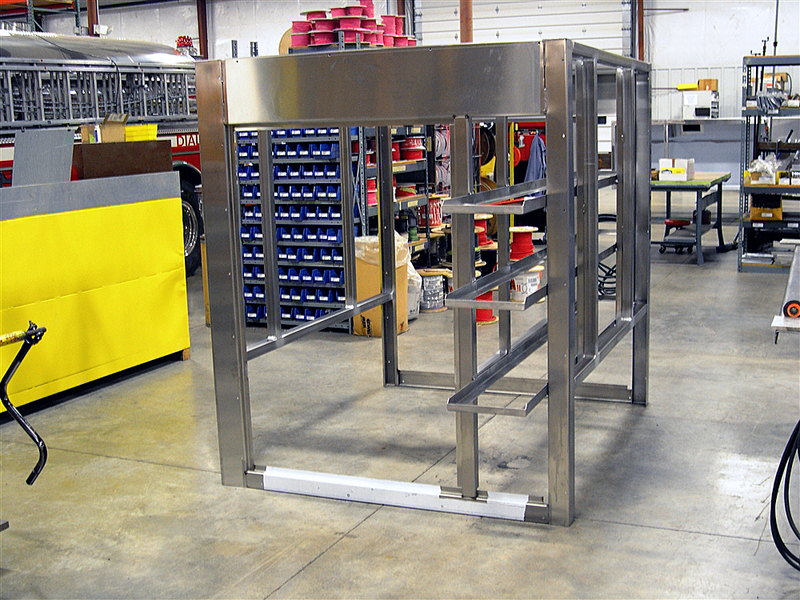 Currently, the district contracts with the village’s fire department to provide fire protection services to its residents. Barrington Village President Karen Darch said the proposal wasn’t meant solely as a cost-cutting measure. Rather, the village hopes to find greater efficiencies through the use of technology, mutual-aid agreements and a more strategic deployment of equipment on calls, she said. “They wanted us to assume responsibility for being the employer,” fire district Trustee Paul Heinze said. The village also requested that it be billed on a monthly basis only for the services it actually used, Heinze added. District trustees concluded such financial arrangement wouldn’t work for them, he said. During the recent talks, the village told the fire district that fire operations made up 42 percent of the village’s budget, Heinze said. 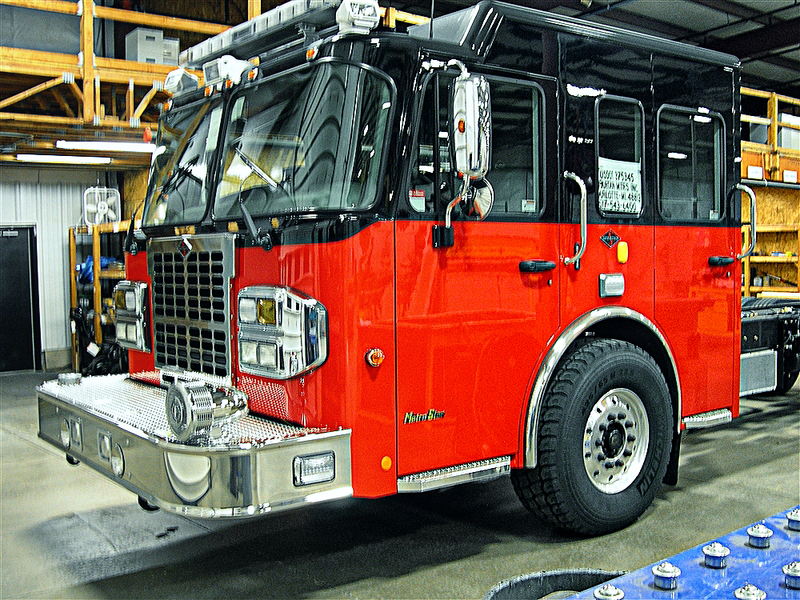 But under the current contract, the fire district pays 62 percent of that to provide staff and equipment needed for its jurisdiction, which includes all or parts of Barrington Hills, Inverness, Lake Barrington, North Barrington, South Barrington and unincorporated Cook, Lake and McHenry counties, he added. The Daily Herald has an article which talks about the Village of Barrington looking at the fire department for cost savings. Though several village departments have experienced layoffs and staff reductions through attrition during the past few years, the fire department hasn’t been among them, Village Manager Jeff Lawler said. 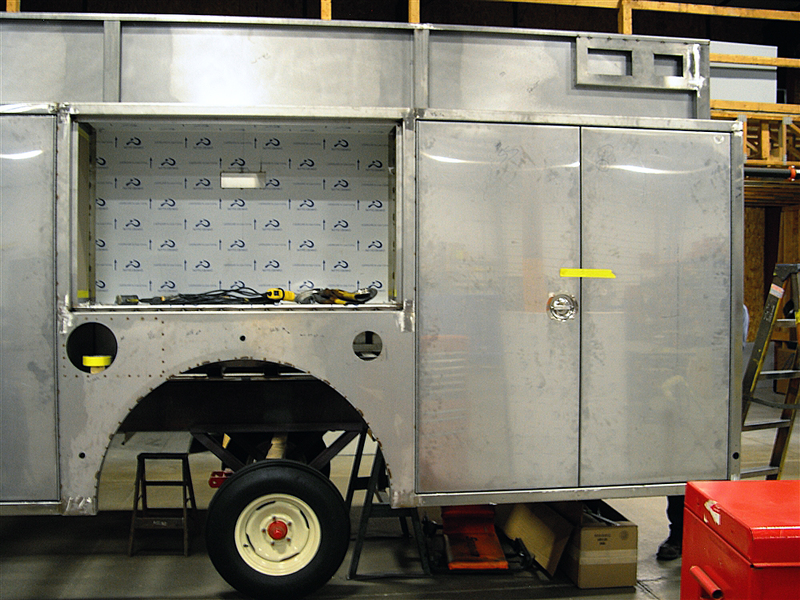 Despite taking pride in a budget trustees already are describing as conservative, village officials have pledged to examine the fire department this year for even greater cost savings. A familiar theme has popped up throughout the country is the reduced number of fires and the increase in EMS responses. Like many other city councils, there appears to be talk of placing more of the burden on mutual aid companies. 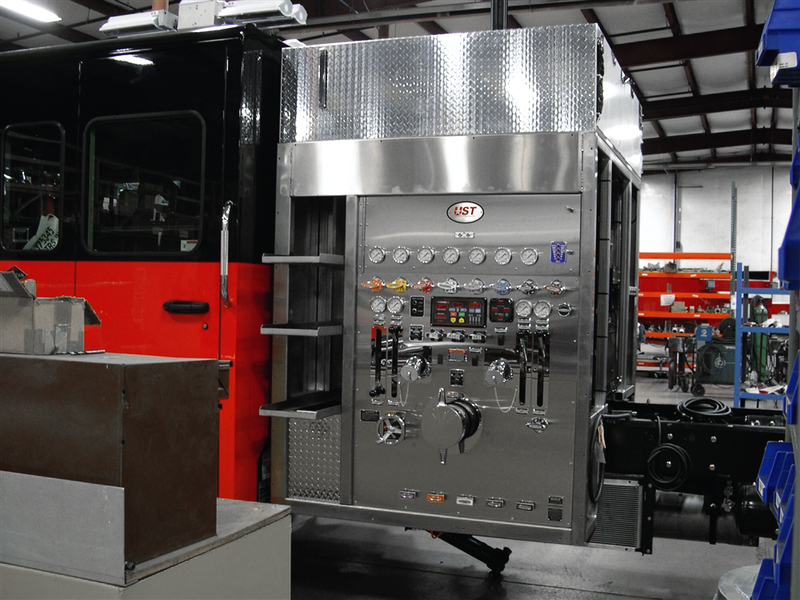 The quest for greater efficiency in costs and equipment deployment will rely heavily on the fact that the majority of fire department calls are medical, and that all structure fires in the region are fought using the mutual aid from several departments anyway, Lawler said. 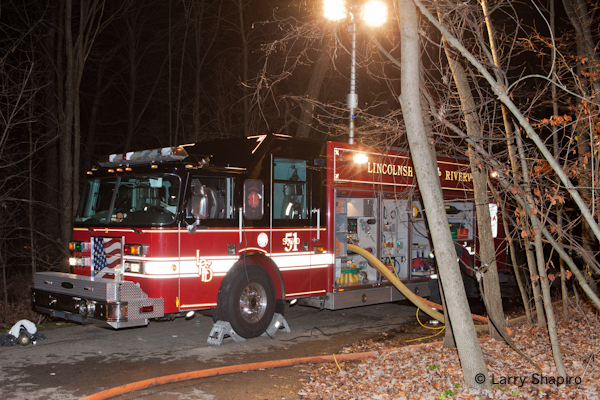 At approximately 10:45PM on Monday, the Lincolnshire-Riverwoods Fire Protection District received a call reporting a brush fire in the 600 block of Portwine Road in Riverwoods. Station 52 companies responded to the address and were unable to locate a brush fire, but they were flagged down by a resident who reported a plane down in a wooded area between two houses down the street. At the same time RED Center received additional calls reporting a house fire and a plane into a house. 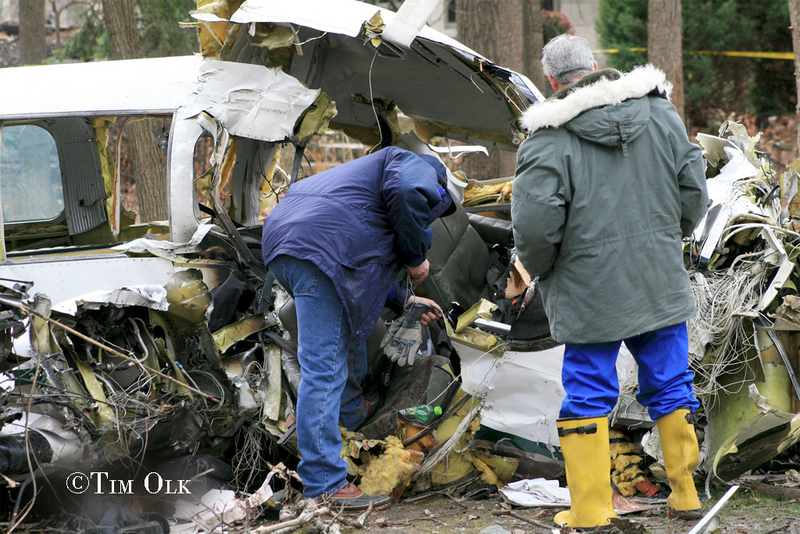 As they were filling out the alarm, the Lincolnshire companies found the crash site which was within 30 feet of a house. 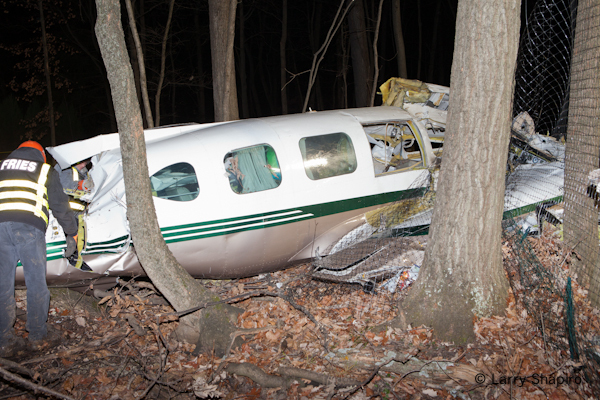 There was a small fire that was addressed with a pump can and firefighters began assessing the plane’s five occupants, one of which was out of the wreckage of the twin engine plane when crews arrived. 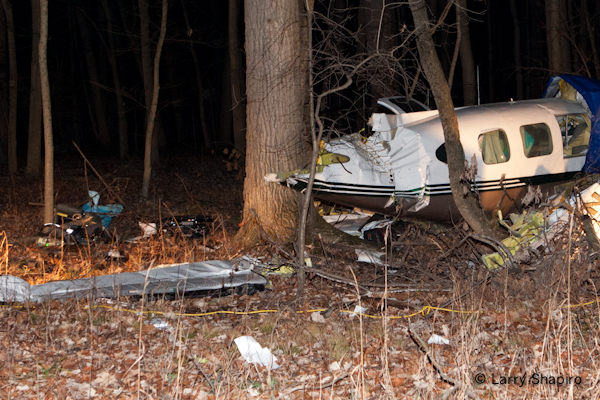 The plane, owned by Trans North Aviation, was transporting the patient, his wife, two pilots and a flight paramedic to the Chicago Executive Airport in Wheeling, about five miles south of the crash site, according to Ron Schaberg, owner and president of the South Carolina company. 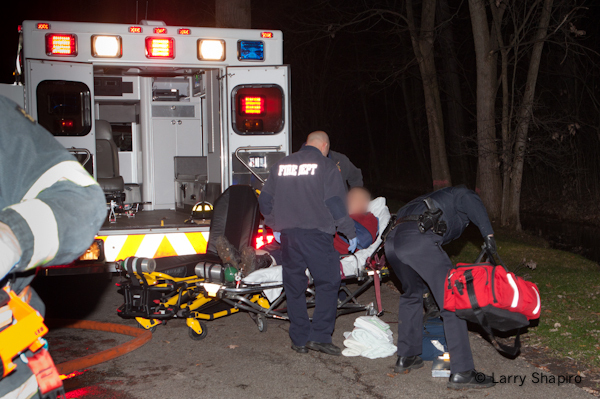 The patient was being brought to a local medical facility for an undisclosed medical issue, Schaberg said. 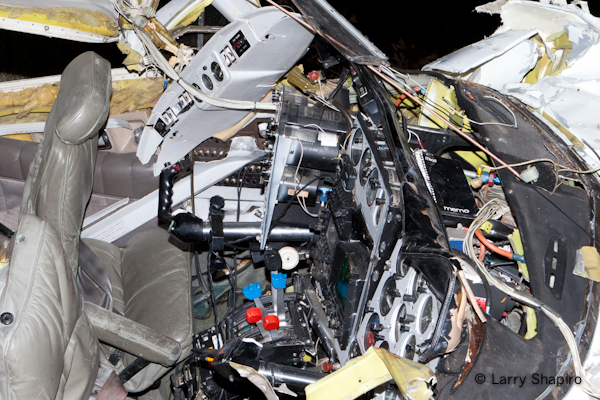 The aircraft, which passed a safety inspection earlier that day, picked up the unidentified male patient fromWest Palm Beach, Fla. just before 6 p.m., but made a fuel stop in Jesup, Ga. before continuing on to Chicago Executive, Schaberg said. 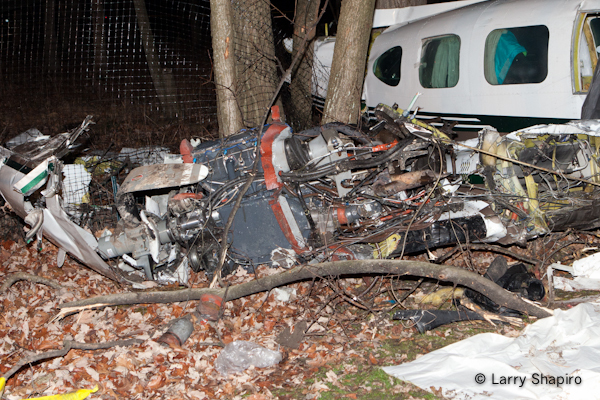 The crash came just after the pilot reported that the plane was having a fuel problem. 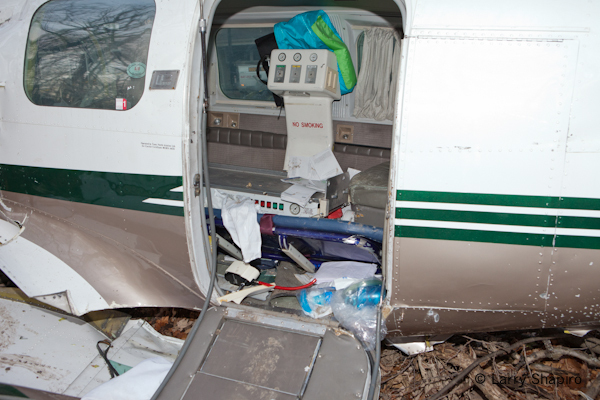 Three passengers were removed from the plane and transported to Lutheran General and Condell hospitals. Two others were pronounced dead at the scene, and the victim that was transported to Lutheran General Hospital, the patient being transported from Florida, subsequently died. 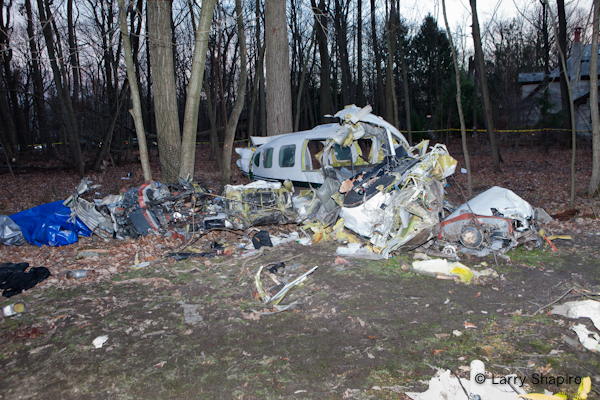 The wreckage remains in place overnight until investigators can examine the crash site in the daylight. 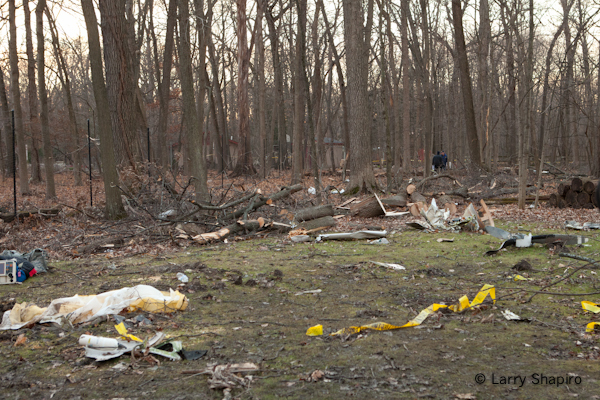 There is a debris field of some 500-1,000 feet through a wooded area which reportedly includes parts high a tree. The Chicago Tribune reports that plane to be a Piper Navajo, but the company website states that they fly a Piper Chieftain, and the Travel-Care Air Medical Transport site mentions a Piper Cheyenne II XL operated by Trans North. 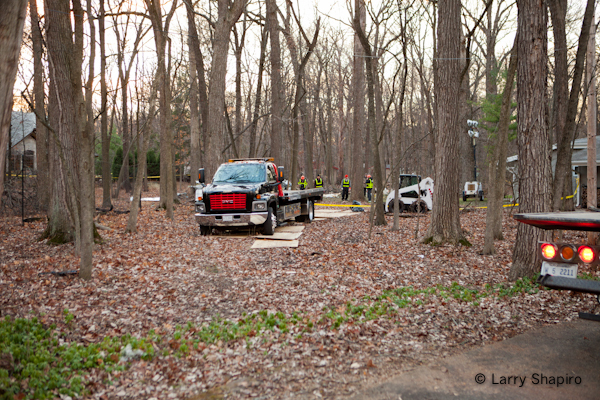 Larry Shapiro and Tim Olk were at the scene. Larry has a gallery HERE and Tim has a gallery HERE. 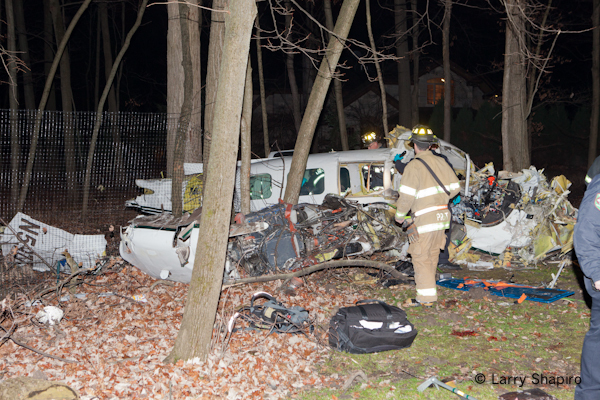 Mutual aid came from Deerfield, Long Grove, Libertyville, Countryside, Buffalo Grove, Prospect heights, and Wheeling. Firefighters rescued three people who were trapped on the third floor of a burning apartment building in Joliet this evening during a blaze that sent four residents to a hospital. 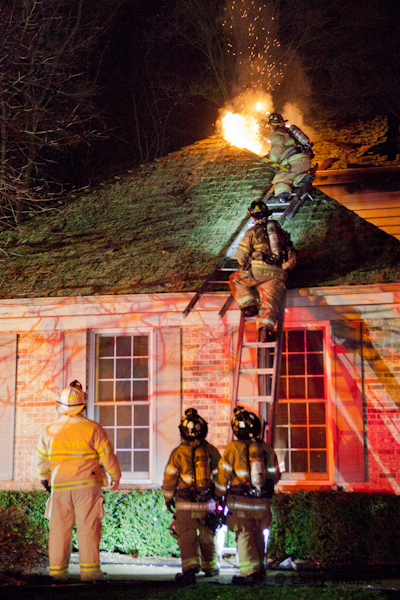 The fire erupted about 5:40 p.m. on the second floor of a 3-story, 12-unit apartment building at 120 Twin Oaks Dr., according to Joliet Fire Capt. Bob Wohlrab. The entire article can be found HERE. Additional articles are HERE and HERE. 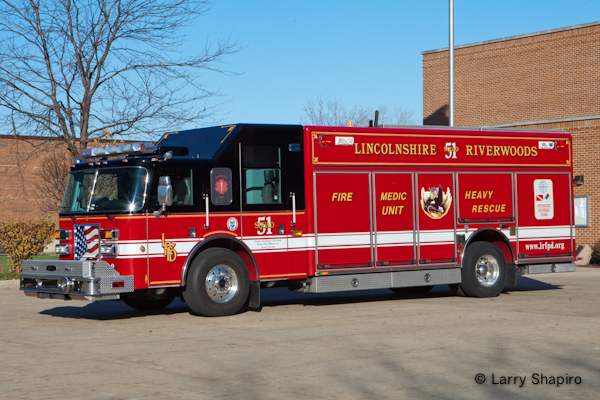 As previously mentioned, the Lincolnshire-Riverwoods Fire Protection District is changing their apparatus from red with a white roof to red with a black roof. 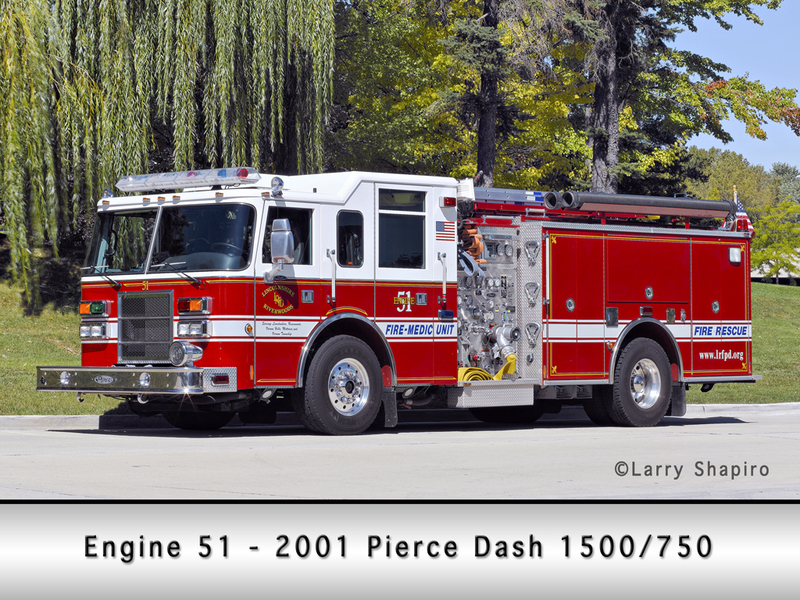 The new Pierce quint arrived with the new scheme and they have since been working on the other front line rigs. 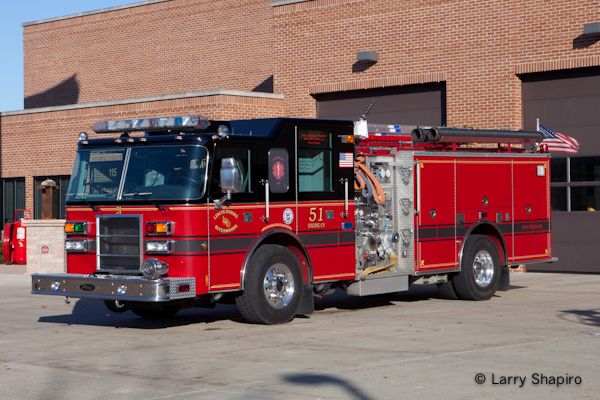 Engines 51 and 52 have new paint and graphics and the squad is mid-change as shown below. 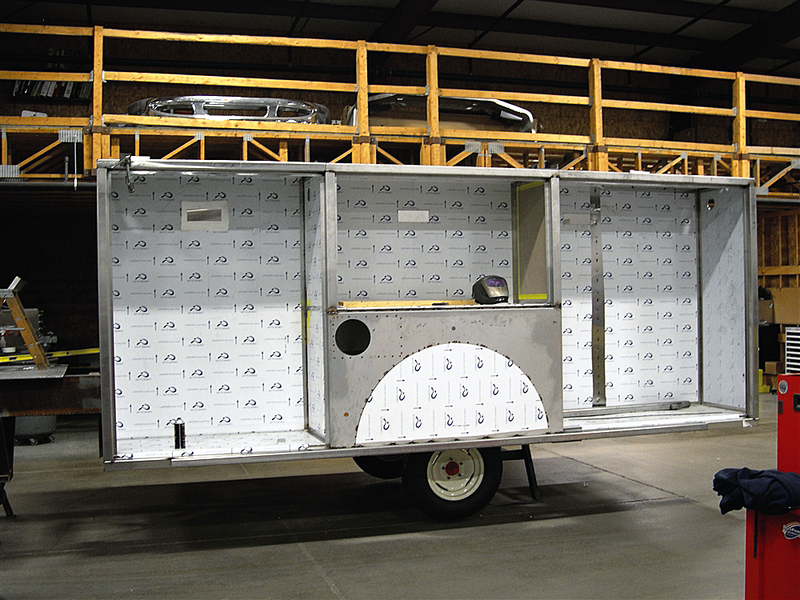 Here is a set of construction photos from the US Tanker web site showing the progression of the new engine. 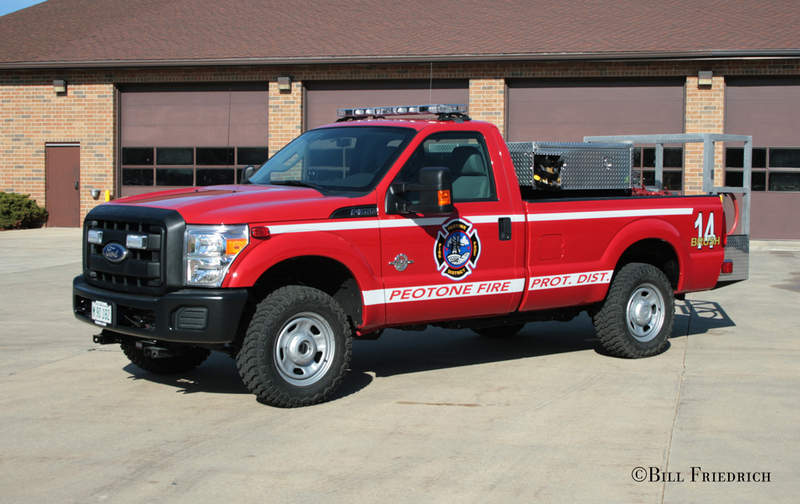 The Peotone FPD has placed two new pieces of apparatus in service. 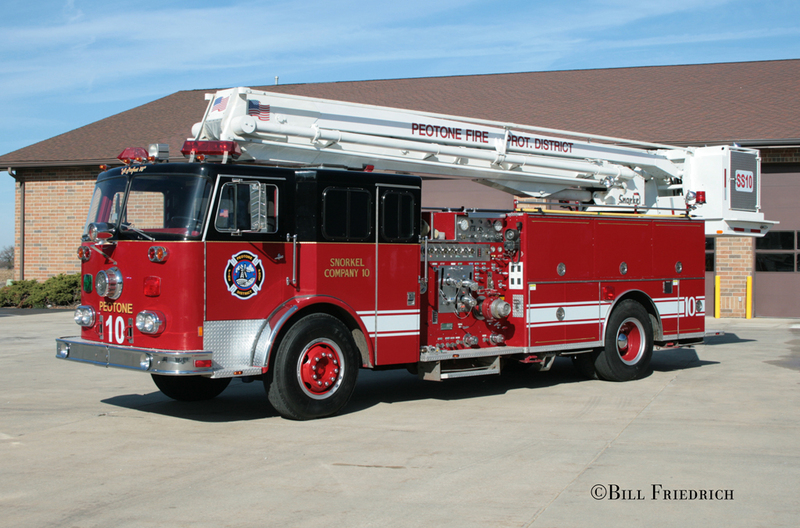 SS10, which came to them from the Normal FD has now been lettered for The Peotone FPD. 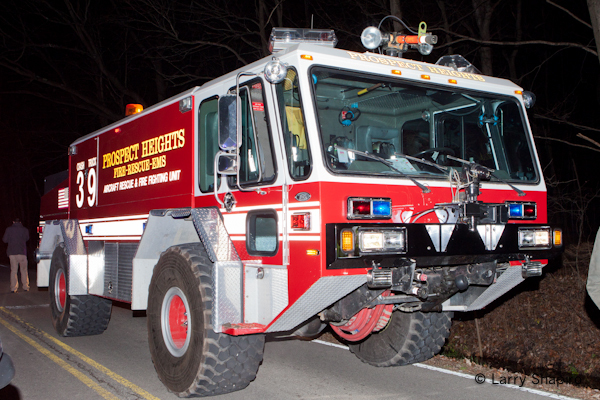 In addition, Brush 14 was placed in service in 2011. 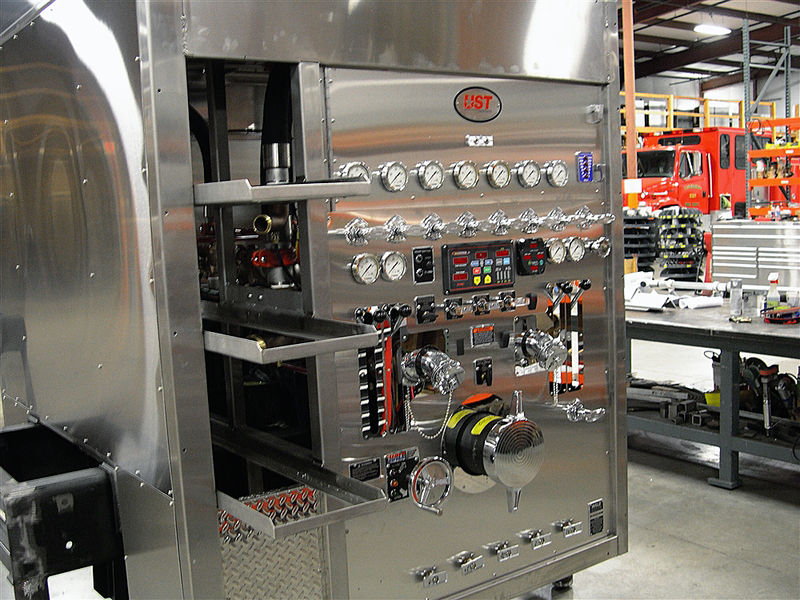 The skid-unit for this rig came off their old brush truck. 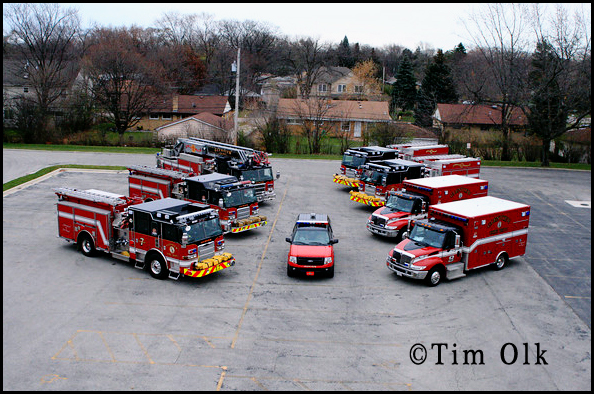 Tim Olk had the good fortune to get the bulk of the Glenview Fire Department front line fleet assembled for a historic photo. 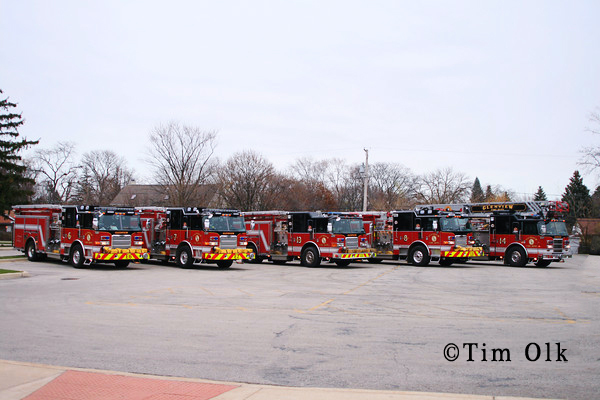 Pictured are Truck 14, Engines 6,7,8,13, Battalion 6, and Ambulances 6 and 8. 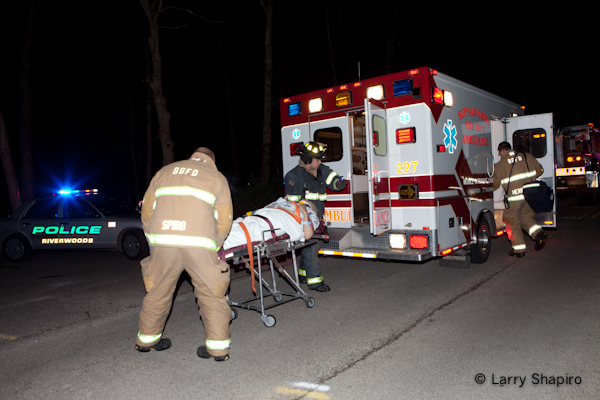 Ambulance 7 was called away for an EMS run and the balance of the fleet represents the department reserve units. 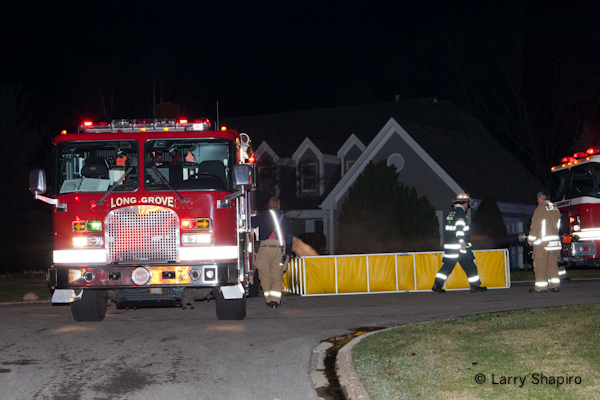 The Barrington Fire Department received a call around 8PM this evening reporting a fire at 340 Weatherstone Road. The call came from a neighbor who saw fire outside the garage. First arriving companies were met by heavy fire at the three-car garage and traveling up through the roof encroaching on the main portion of the house. Shortly thereafter a Box Alarm was requested which brought tankers to this non-hydranted subdivision near Lake-Cook and Ela Roads. Fire was in the garage attic and portions of the second floor attic as well before firefighters were able to stop it from spreading further. 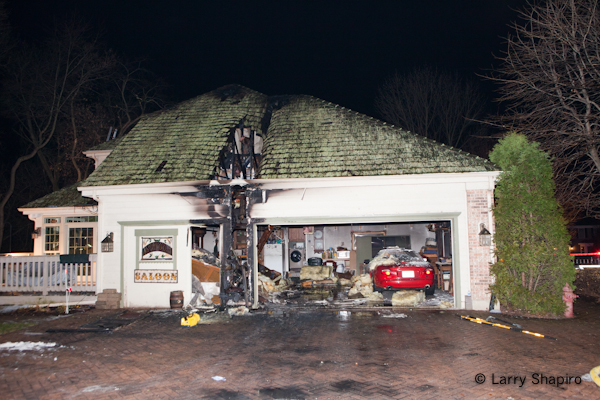 Both vehicles in the garage were virtually undamaged. 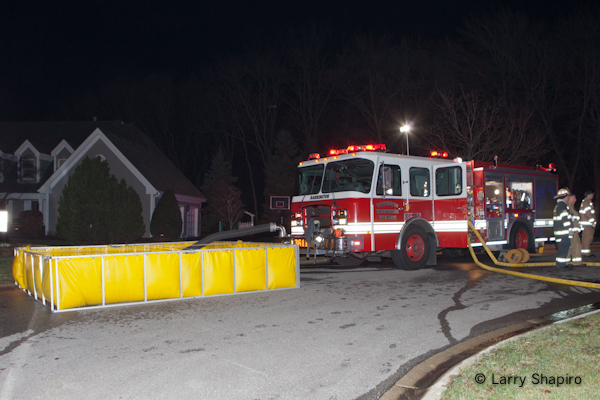 The first Barrington engine was in the driveway and was fed by the second engine in front of the house. A porta-tank was dropped by this engine and the tankers kept the water supply consistent. Larry Shapiro went to the scene and arrived after the fire had been knocked down. 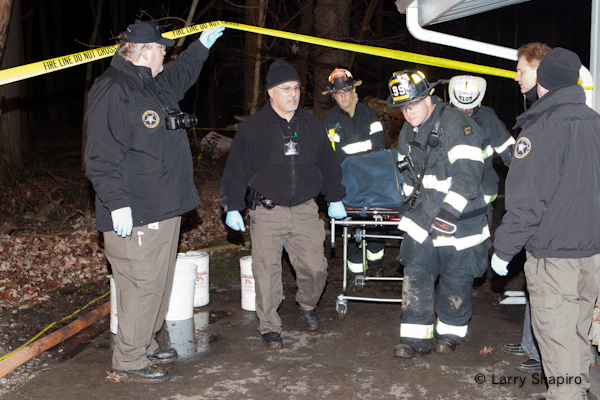 He submitted several images from the scene and has a small gallery with additional images HERE.